The U.S. dollar recovered from the losses from Wednesday led by slightly better inflation report and budget deficit narrowed to $13.5 billion year on year from $23.2 billion. On the economic front, data from the UK showed inflation fell more than expected to 1.8%. Economists polled were expecting a decline to 1.9%. The core inflation rate increased steadily to 1.9%. In the Eurozone, industrial production decreased more than expected to 0.9%. Economists forecast a decline to 0.4% on the month. Sweden's Riksbank held its monetary policy meeting yesterday. The repo rate kept at -0.25% as expected. The central bank signaled that it would hike rates once more during the second half of the year which would bring the repo rate to zero percent. In the United States, consumer prices stayed flat during January. The core inflation rate rose by 0.2% which was within expectations. However, yearly, headline inflation rose to 1.6%, which scored better than expected, while core inflation kept stable at 2.2%. The markets opened to the quarterly GDP data from Japan. Data showed that Japan’s GDP in the fourth quarter of 2018 advanced 0.3% This was slightly slower than the median expectations of a 0.4% increase. Still, the fourth quarter GDP was better compared to the third quarter's contraction of 0.6%. China released the monthly trade balance figures which advanced to 39.2 billion against expectations of a decline to $33.5 billion. The European trading session will start with the GDP figures for Germany for the fourth quarter. Data should show that Germany’s GDP advanced 0.1% on the quarter ending December 2018. This follows a 0.2% decline in the second quarter marking a contraction in the economy. The flash GDP figures for the Eurozone are next and no changes are expected as the Eurozone’s economy is expected to be confirmed at 0.2% growth rate for the fourth quarter of 2018. The NY trading session will see the manufacturing sales report from Canada followed by the retail sales report from the United States. U.S. retail sales should see a 0.1% increase this month, slightly lower than the 0.2% increase from the month before. Core retail sales are expected to remain flat during the month after increasing 0.2% previously. Producer prices index data is also on the tap today. Headline PPI should rise by 0.1% on the month while core PPI is expected to grow by 0.2% following a 0.1% decline in December. EURUSD (1.1278): The euro currency reversed gains after a brief rally to the resistance level of 1.1327. However, price action failed to capitalize on the benefits and ended up breaking down lower. This leads to a divergence on the charts with the current lows reflected with a higher low in price. A bullish follow through here could see the EURUSD retesting the resistance level of 1.1327 followed by a move to 1.1435. 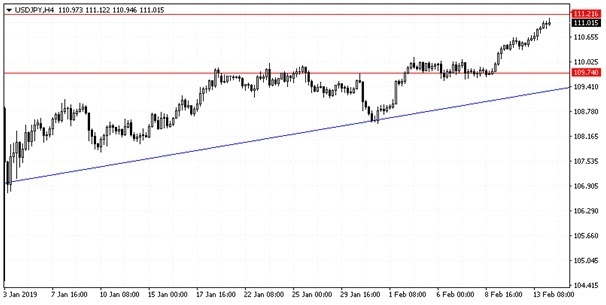 USDJPY (111.01): The USDJPY currency pair maintained strong gains as the price inches closer to 111.21. 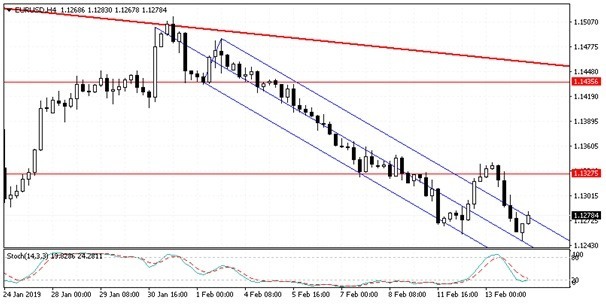 We expect to see a reversal at this level which could see some downside in the currency pair. The lower support at 109.74 remains a key level of interest, and the USDJPY could maintain a sideways range as a result. If the bullish momentum will push the USDJPY higher, then we could expect further gains on a successful breakout above 111.21. 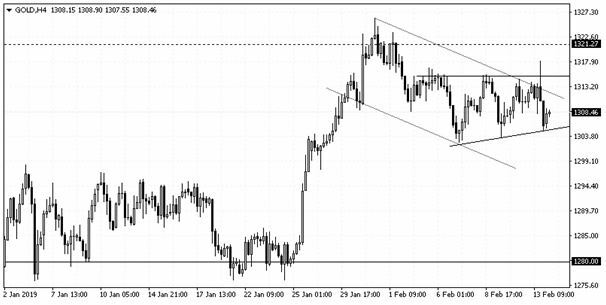 XAUUSD (1308.46): Gold prices slipped from intraday high of 1318.07. However, price remains firmly within get bullish flag pattern that is formed on the daily chart. With the market sentiment a bit choppy, we expect this to be reflected in the price action of gold. The resistance level sits at 1321.27 which could be tested in the near term. There is also a potential ascending triangle pattern that is currently shaping up on the 4-hour chart. A successful upside breakout from this ascending triangle could potentially validate the bullish flag pattern with further gains likely in store to the upside. If the minor rising trend line is breached, we could expect to see some declines in store to the downside with the flag pattern being invalidated.